We’d love your help. Let us know what’s wrong with this preview of Arguing about Slavery by William Lee Miller. A blow-by-blow re-creation of the battle royal that raged in Congress in the 1830s, when a small band of representatives, led by President John Quincy Adams of Massachusetts, employed intricate stratagems to outwit the Southern (and Southern-sympathizing) sponsors of the successive "gag" rules that had long blocked debate on the subject of slavery. To ask other readers questions about Arguing about Slavery, please sign up. Every student in America should be required to read this book, along with C. Vann Woodward's The Strange Career of Jim Crow. Miller has provided a lesson in the true meaning of democratic values. This is a favorite. I recommended it to the Adams County Library and they bought two! Mr. Miller almost makes the steam rising above Congress also rise from the pages of this book. I've read it several times. In order to establish a union, the nation’s founders had to craft documents acceptable to both northern and southern states. Therefore, the U.S. Constitution both allowed for the practice of slavery and provided the means of abolishing it. The words slave and slavery are never mentioned in the document, and the founders edited out specific references to white men. The United States were founded upon principles of equality and civil liberties and as a representative government, which afforded ope In order to establish a union, the nation’s founders had to craft documents acceptable to both northern and southern states. Therefore, the U.S. Constitution both allowed for the practice of slavery and provided the means of abolishing it. The words slave and slavery are never mentioned in the document, and the founders edited out specific references to white men. The United States were founded upon principles of equality and civil liberties and as a representative government, which afforded openings to correct the massive injustice of slavery. The First Amendment provides five rights or freedoms: speech, press, religion, assembly, and petition. Although little thought of today, the right of petition meant a great deal in antebellum America. Constituents could petition their representatives to correct grievances. Many northerners requested the introduction of measures to abolish slavery. Southerners, finding the reading of such petitions unacceptable, invoked a gag rule against them. Anti-slavery petitions were not permitted to be read on the House floor. It sounds dry, but it isn’t. I have bought two copies of this book and read it cover-to-cover twice. Miller makes history—the kind you don’t learn about in history courses—come alive. I came away from this book with great admiration for John Quincy Adams and for the resiliency of our Constitution. We are still one country and slavery was abolished via constitutional amendment. Thank you, John Quincy Adams. A fascinating story told with supreme skill by William Lee Miller. John C. Calhoun will enrage you with his Orwellian justifications for slavery. John Quincy Adams' audacious exploits will leave you in awe of his chutzpah. The quaint idiosyncracies of old-time Congress will have you chuckling. And you'll come away learning a whole lot. This book is awesome! I generally don't read many history books and even less that are this in depth about the goings on in congress. But I've heard this book recommended by several people. Frequently I've heard and wondered myself why it took the civil war to end slavery. Why didn't the people just vote to end it? Was the whole nation racist? Why did it cost over 600,000 lives to pay for the sin of slavery? I think everyone should read this book to understand the political climate of the nation at the time as well a I generally don't read many history books and even less that are this in depth about the goings on in congress. But I've heard this book recommended by several people. Frequently I've heard and wondered myself why it took the civil war to end slavery. Why didn't the people just vote to end it? Was the whole nation racist? Why did it cost over 600,000 lives to pay for the sin of slavery? I think everyone should read this book to understand the political climate of the nation at the time as well as the motivations on both sides. I was surprised at how it was virtually impossible for anyone to even bring up the subject of slavery in congress. If you did all the democrats from the slave states would give red faced speeches flowing with righteous indignation claiming you were treasonous and traitor who wishes to dissolve the union by daring to question slavery. You were the lowest of the low to them. But it wasn't just angry words in congress as we found out. Even if you lived in the north and were outspoken about abolition your house could be ransacked and all your furniture thrown in the street at burned, you could be beaten and stoned. Governors in the north sympathetic to slavery could have you run out of town. Elijah Lovejoy was killed by a mob while defending his printing press in Illinois. In the south it was much worse abolitionists were threatened with death if they brought any abolitionist material south. Even the postal service in the south was burning any such material and the issue was later brought up on congress. The author paints a vivid picture of the U.S. in the early 1800's starting with the forming of the abolition society who was primarily comprised of Quakers and who's flyers were mostly handed out by women. They were also instrumental in organizing the signing of petitions to abolish slavery. These petitions were brought forth in congress dutifully by a few of their representatives as the author pointed out even if they didn't agree with the petitions. They felt it their duty and honor to defend the right to petition as granted in the first amendment. The travesty was that as soon as someone tried to read one in congress they'd get shouted down and a vote would be called to "table" the petition which basically meant they would lay the petition on the table and never look into it. So, the people’s right to petition was being ignored. About 230 pages in or so it starts getting good. J.Q. Adams (former president now congressman) relentlessly raises the slavery issue over and over by presenting petition after petition. The dude had some balls and it was great watching the southern congressmen squirm then get outraged and hurl insults, and in many cases walk out. Despite his boldness the pro abolition members did not have the numbers to affect any real change. Any time he tried to propose something or have something sent to committee they were voted down. So much so that they eventually passed a gag rule saying anything having to do with slavery was automatically tabled and was not to be talked about. He agitates them so much they vote to censure him. The best part is he votes for himself to be censured too! Because if he is censured he has the right to defend himself which means they can't stop him from talking about whatever he wants. 'Let's have it out Let's see if you can censure me. Have you considered what that means?' I won't tell you how that works out but it's probably the best part. This book is primarily about the struggle by J.Q. Adams and a few other like minded congressmen trying to get the gag rule overturned. It's brought up how many abolitionists are famous for changing the public sentiment on slavery but a number of politicians like J.Q. got very little credit when they were the ones in congress actually trying to affect change of the laws. Miller uses that image to discuss how big, powerful, and everpresent slavery was in the early 19th century---only slavery interests were bigger and stronger than the tobacco empire ever was! Today we don't have a lobby group as strong as tobacco in the 90s, and tobacco in the 90s was not as strong as slavery in the 19th century. Miller has a way of explaining ideas and concepts in a way that has you thinking, "I knew that, but I never really thought of what that meant." This was a book that on just about every page there was an idea or concept that I wanted to remember. The book is largely about John Quincey Adams and his efforts to oppose the gag rule in Congress. A rule that said you can't talk about slavery. The stories are hilarious. The Nine Women From Richmond and the 22 Slaves from Virginia are well worth the read. Rules be damned. Go ahead and censure me... I welcome it was his motto. A delve into the politics and government of the 19th century, and the nine year debate in the U.S. Congress of eradicating the peculiar institution of slavery from the fabric of America. "Shame on a nation that fosters and sustains an institution which dares assail and would destroy the sacred right of petition." Long before Sen. Charles Sumner spoke about Bleeding Kansas and was soon thereafter caned on the floor of the Senate by Congressman Preston Brooks, the Congressional waters had ben moving to an ever-higher boil on the slavery issue. One of the leaders in the battle against slavery was Massachusetts Congressman and former President John Quincy Adams. Earning the sobriquet "Old Man Eloquent" on this issue, in this ever-heating contest, Adams finally got a House gag rule overturned that had prohibit Long before Sen. Charles Sumner spoke about Bleeding Kansas and was soon thereafter caned on the floor of the Senate by Congressman Preston Brooks, the Congressional waters had ben moving to an ever-higher boil on the slavery issue. One of the leaders in the battle against slavery was Massachusetts Congressman and former President John Quincy Adams. Earning the sobriquet "Old Man Eloquent" on this issue, in this ever-heating contest, Adams finally got a House gag rule overturned that had prohibited antislavery petitions from the general public from even being discussed. Adams had been a free-soiler, opposed to the expansion of slavery for many years. But his well-known legal defense of the Amistad defendants moved him beyond free-soiler to abolitionist. Miller makes Adams fire on the floor Congress come alive, and puts into context. Much of that context carries through to the 1860s and beyond. For example, Miller points out that two decades before Lincoln thought of it, Adams opined that Presidentail war powers might be used to abolish slavery during a civil war. At the same time, Miller reaches further back into history, to point out the early history of slavery in the North. (In the middle 1700s, New York's population may have been as high as 14 percent slave.) That's important to show how Southern arguments and fears that they A. could not do without slavery and B. would not know how to let such a large population go free, were groundless. Here's a few more fascinating and important historical tidbits from the book. Page 17 - Jefferson, while a member of the Confederation Congress in 1784, authored a provision to exclude slavery not just from the Old Northwest, but ALL Western territory on the far side of the Appalachians. It failed by one state's vote, which he claimed in turn was lost due to the illness of one delegate. Page 349 - Showing a fine-tuned sense of satire, even sarcasm, during gag rule debate in the 25th Congress, Adams proposed Congress form a "Committee of Color," specifically designed to investigate Congressional bloodlines, with the "impure" to be summarily expelled. Page 478 - A fine illustration of the morals of the white knights of the patrician South: Henry Hammond, southern ultra already at this time, in the House, and as Senator, deliverer of the "Cotton is King" speech, was a rou? first class. He took an 18-year-old slave with 1-year-old child as a mistress, then when the child turned 12 took her as mistress too. He also had some degree of attachment to the four teenage daughters of Wade Hampton II, father of the Civil War general. John Quincy Adams was one bad mofo (and by bad I mean good, and by mofo, I mean mofo). This is a phenomenal book about JQ Adams spending ~10 years arguing in front of congress to defend the right of citizen's to petition (even though the right to petition is guaranteed by the First Amendment of the Constitution). What makes this story fascinating is that JQ Adams' fight revolved around congress refusing to have petitions presented to them that sought to abolish slavery in Washington, DC. So JQ A John Quincy Adams was one bad mofo (and by bad I mean good, and by mofo, I mean mofo). This is a phenomenal book about JQ Adams spending ~10 years arguing in front of congress to defend the right of citizen's to petition (even though the right to petition is guaranteed by the First Amendment of the Constitution). What makes this story fascinating is that JQ Adams' fight revolved around congress refusing to have petitions presented to them that sought to abolish slavery in Washington, DC. So JQ Adams wasn't just fighting to defend the freedom of citizens and their inalienable rights, but he was also standing up to congress about slavery, which makes him among the first elected officials, if not the first, to do so. It is really an amazing part of US History that is little known and JQ Adams' fight for the rights of all citizens, often by himself without real support, makes him one of the most underrated American heros. The short of it is people in the North started getting more outspoken about slavery and sent petitions to congress to outlaw the practice in the nation's capitol (something unseemly about congressmen of a supposed free country having to walk by shackled slaves up for sale on their way to work, go figure). Unfortunately, about half the House was made up of slaveholders and most of the other half didn't want to get in to a political battle (since the Constitution gave them no right to ban slavery in the Capitol), so the petitions were simply laid on the table and summarily dismissed. This was a practice followed for a number of years but in the 1830s, the Southern congressmen didn't even want the petitions to be laid on the table, they wanted them to be dismissed before even reaching congress. This led to the 10+ year battle fought by JQ Adams, a fight that led to the gag rule and even an attempt to censure him on the floor of congress. Even though it sounds dry, it's quite a compelling story as Adams used all kinds of ingenious legislative tricks to keep the issue from dying and to get around the gag rule. For example, as part of his defense at his censure trial, he simply asked the Speaker of the House to read the Declaration of Independence out loud (you know, the document his dad wrote). Through it all, Adams stood mostly alone and in the most clever ways made sure the issue of slavery and freedom never left the minds of congressman. Sometimes you need to take small steps to solve large issues. The gag rule in the U.S. House of Representatives, which forbade even the DISCUSSION of the slavery issue, is the subject of William Lee Miller's excellent book. As the title indicates, former President John Quincy Adams was at the forefront of the battle to rescind the gag resolution, laying the groundwork for a build-up of anti-slavery sentiment in the 1840s and 1850s. That Adams served in Congress after having been a United States p Sometimes you need to take small steps to solve large issues. 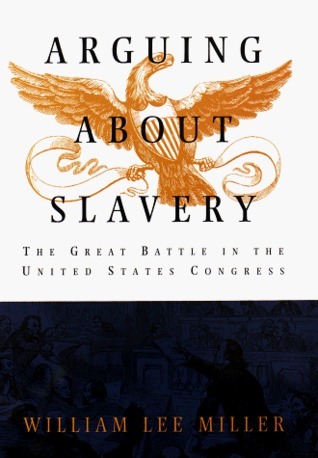 The gag rule in the U.S. House of Representatives, which forbade even the DISCUSSION of the slavery issue, is the subject of William Lee Miller's excellent book. As the title indicates, former President John Quincy Adams was at the forefront of the battle to rescind the gag resolution, laying the groundwork for a build-up of anti-slavery sentiment in the 1840s and 1850s. That Adams served in Congress after having been a United States president should tell you something about his commitment; because of that and, obviously, his anti-slavery work, Adams, in my mind, is one of the most underrated great Americans to serve as a public official. "Arguing About Slavery" could have been tedious, as it describes in detail machinations of the pro-slavery faction and those like Adams trying mightily just to get the issue talked about. Instead, the book is fascinating start to finish. Included are illuminating excerpts of Congressional minutes and backgrounds of the issue and the participants. That Adams and others refused to let silence shroud the issue makes you want to stand up and cheer. Miller's book is important in shedding light on their painstaking, dogged work. A nice book to go along with this one would be "All on Fire," Henry Mayer's biography of William Lloyd Garrison, another slavery foe and underappreciated great American. Very dense, and convoluted writing style. However, well researched and fascinating depiction of John Quincy Adams' long-suffering dedication and contributions to the fight to end slavery. Outrageous tactics, behaviors and speeches given by House of Representatives members.I learned a lot. On this day in 1865, The U.S. Congress passes the Thirteenth Amendment to the Constitution, outlawing slavery. And here's an excellent book about John Quincy Adams's fight against the "gag rule", not only (importantly) as an important battle for freedom of speech (to exercise it in CONGRESS, no less! ), as well as in the efforts to outlaw slavery (the substance of the petitions Adams was presenting whose very existence Southern Congressmen didn't even wish to have acknowledge). An absolutely brill On this day in 1865, The U.S. Congress passes the Thirteenth Amendment to the Constitution, outlawing slavery. And here's an excellent book about John Quincy Adams's fight against the "gag rule", not only (importantly) as an important battle for freedom of speech (to exercise it in CONGRESS, no less! ), as well as in the efforts to outlaw slavery (the substance of the petitions Adams was presenting whose very existence Southern Congressmen didn't even wish to have acknowledge). An absolutely brilliant book. Incredibly moving: the only book I've ever read that literally brought me to tears while reading it. But at the same time, wonderfully informative and evocative of the amazing historical events of the day. If you liked the movie "Amistad," you will love this second look at John Quincy Adams' incredibly brave stand during what William Freehling has called the "Pearl Harbor of the Civil War." I cannot recommend this book highly enough. A very in depth survey of a a little known but nonetheless very important period of American history. I am giving this work four stars based upon the impressive amount of research Miller did in writing this book, but he also has an unfortunate tendency to editorialize and it is beyond question that in his view the North had the white hats and the South the black. He also tends to focus on politicians on the Northern side of the aisle, describing their lives in between congressional sessions with A very in depth survey of a a little known but nonetheless very important period of American history. I am giving this work four stars based upon the impressive amount of research Miller did in writing this book, but he also has an unfortunate tendency to editorialize and it is beyond question that in his view the North had the white hats and the South the black. He also tends to focus on politicians on the Northern side of the aisle, describing their lives in between congressional sessions with some frequency. There is very little of this done for any of the Southern politicians, Calhoun, Hammond, Pinkney and so forth. Which is unfortunate in the extreme. After all, since the primary focus of the book is John Quincy Adams and the clearly unconstitutional "gag rule," it would have been interesting to learn how the slave-owning gentlemen claiming slavery was so beneficial actually behaved toward their slaves. Richly detailed, beautifully written narrative about a little known episode in the long run-up to Civil War. Former President John Quincy Adams becomes a Member of Congress and champions the right to present abolitionist petitions on the floor of the House of Representatives, runs into a buzzsaw of opposition from the South Carolina delegation. I love history, and even I thought a book on the 9-year-long gag order against discussing slavery in Congress couldn't possibly be that compelling. I was wrong. I don't know how Miller does it, but this is one of the most interesting books I've ever read. Be warned: it will also make you want to become president of your local John Quincy Adams fan club. My book club read this book several years ago. The author's research was impressive and I learned more about pre civil war US than I'd ever known. John Quincy Adams was a bull dog! He was not officially associated with the abolitionists, but did us all a great service by keeping open discussion from withering away in the US congress. My mouth is full right now, but I have so many things I want to say. First, I'll comment on the crackers I'm eating. Not cracked pepper, which I prefer. But dill or something. Weird tasting. Now I'll comment on this book. Good book. I liked it. A great story, well written. I have read several of Prof. Miller's books. This was one of the most interesting. Awesome book- recommended for everyone. Awesome research--on the raison d'etre of slavery..The supporters and the obstructionists. William Lee Miller is Scholar in Ethics and Institutions at the Miller Center. From 1992 until his retirement in 1999, Mr. Miller was Thomas C. Sorensen Professor of Political and Social Thought and Director of the Program in Political and Social Thought at the University of Virginia. He was professor of religious studies from 1982 to 1999, and chaired the Department of Rhetoric and Communication William Lee Miller is Scholar in Ethics and Institutions at the Miller Center. From 1992 until his retirement in 1999, Mr. Miller was Thomas C. Sorensen Professor of Political and Social Thought and Director of the Program in Political and Social Thought at the University of Virginia. He was professor of religious studies from 1982 to 1999, and chaired the Department of Rhetoric and Communication Studies from 1982 to 1990.